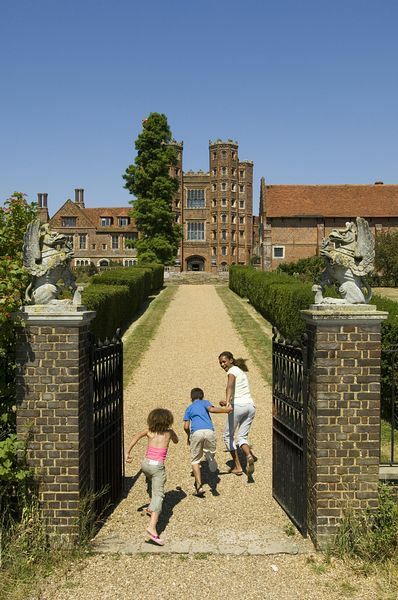 Layer Marney Tower was built between 1515 and 1525 and is the tallest Tudor Gatehouse in the country. Henry 1st Lord Marney was Henry VIII's Lord Privy Seal and he built himself a house which was, he thought, magnificent enough for a person of his position. Henry VIII was so impressed he came to stay in August 1522. The place must still have been a building site as Henry Marney died before his "dream palace" was completed. Only the magnificently decorated front side with the Gate house were built. The Gardens were created in the late 19th century changing the approach to the house to the plain side and the gardens on the pretty side. There are lovely roses, yew hedges, fountains and herbaceous borders. Tea at Layer Marney is a real treat, with home made cakes, scones and biscuits. They also have ploughman's lunches, freshly brewed coffee, as well as cool drinks and ice creams. When you climb the Tower you have a chance to see some of the Tower rooms which, bit by bit are being developed. Travelling exhibitions are sometimes on display. The views from the top are wonderful right out to the Blackwater and beyond. 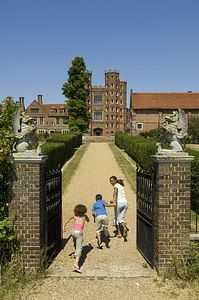 Layer Marney Tower is available for Corporate events, Weddings, Banquets and also holds regular special events. Please see our website for further information. Situated one mile off the B1022 Colchester to Maldon road. The Tower is 6 miles from Colchester and 9 miles from Maldon.